Airborne Trampoline KW is a recreational and competitive trampoline facility located in Cambridge, with Olympic quality trampolines for use by the public as well as the gymnastics community. With a focus on safety, and all of their coaches are certified by the National Coach Certification Program and Gymnastics Ontario. Participants have fun and build on their skills while also getting a great workout! 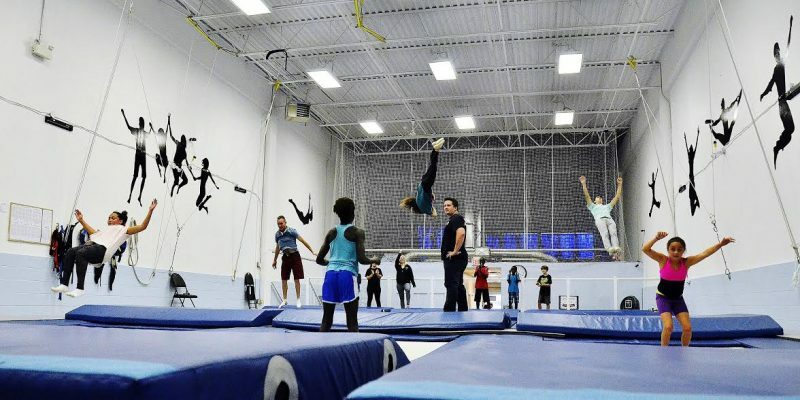 Airborne Trampoline offers a number of different programs for all ages and skill levels. Their Recreational classes can accommodate everyone, whether a beginner or advanced student. Airborne’s award winning Competitive Team holds tryouts for new members and is designed to take existing skills to the next level. Trampoline Birthday Parties are packed with games, high energy music and a live performance at the end featuring flips, jumps and other moves. Day camps, including holiday, March Break, and PA day camps, mix professional instruction together with games and daily outings. Special needs classes, Adult classes, and Parents & Tots classes provide exercise and fun for all ages. Their Freestyle classes are geared toward learning moves for skiing, snowboarding, wakeboarding, or other freestyle sports. For a fun night out, families and friends will enjoy the Public Jump – a one hour glow-in-the-dark and cosmic lighting open jump for up to 12 people. Airborne can also be seen at festivals, events and fairs using their portable trampolines to perform demonstrations and free bouncing. Only the highest quality equipment is used at Airborne Trampoline KW, adding to their “Safety First” approach to the sport of trampolining. Their Olympic trampolines, crash mats, and gymnastics/trampoline equipment are all manufactured in Canada. Open 4-8pm on weekdays and 10am to 6pm on weekends, as well as during select PA days and statutory holidays.